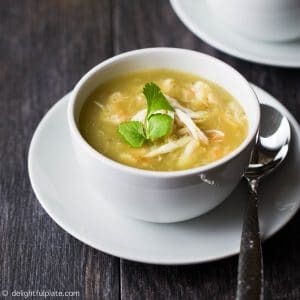 Seafood Opo Squash Soup is tasty, healthy and filled with delicate natural sweetness from opo squash, shrimp, and crab meat. With just one pot and a handful of ingredients, this easy soup will come together in less than 30 minutes. 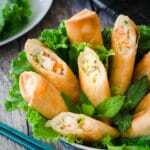 Whenever I travel back to Vietnam, I try to stuff myself with a lot of good food. It was no different this time. The next day after my long flight to Vietnam, my mom took me to a restaurant specializing in soups in Hanoi. I ordered crab opo squash soup and really enjoyed its sweet and delicate flavor. 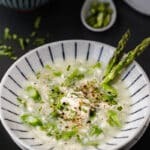 I immediately thought I needed to recreate this soup at home. So here it is, my seafood opo squash soup, inspired by my recent trip to Vietnam. I added shrimp because shrimp and opo squash is a classic pairing in Vietnamese cooking. 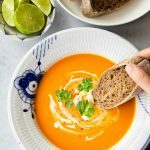 This soup is made from all natural ingredients and dairy-free. 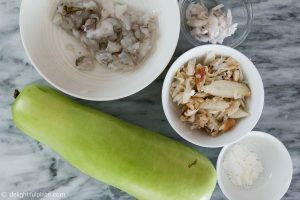 The main ingredients are opo squash, shrimp, crab, shallot, fish sauce, stock and some cornstarch (or tapioca starch). Here is a photo of opo squash in case you are not familiar with it. 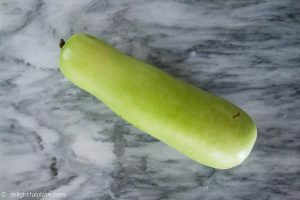 In Vietnamese, opo squash is called “qua bau.” It has a light green smooth skin and a long or bottle shape. When cutting open an opo squash, you will see that the center contains a spongy white part with seeds and this part should be discarded before cooking. When cooked, opo squash is mildly sweet. Opo Squash a popular vegetable in Vietnam, and the most popular dish is opo squash soup with shrimp. 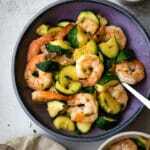 The sweetness of shrimp compliments the mild flavor of opo squash extremely well. You can find this vegetable at Asian grocery stores or some Western grocery stores. Look for the one that feels heavy for its size. You can also buy winter melon (“qua bi“) instead of opo squash since they are used interchangeably in Vietnamese cooking. 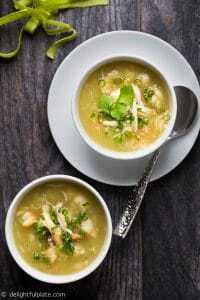 It’s best to use a stock with light flavor for this soup. 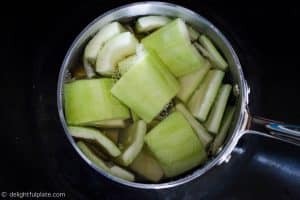 I use kombu stock, and I think vegetable stock, chicken stock or pork broth will also work. 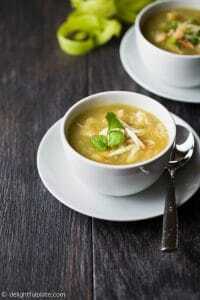 Despite having delicate flavors, this opo squash soup is surprisingly filling. I attribute it to a high ratio of shrimp and crab meat to liquid. That is how I like my soup to be, but you can surely add more liquid and adjust it to your liking. Chop shrimps into small pieces and set aside. Trim off both ends and peel opo squash, then cut in half lengthwise. Cut in half lengthwise one more time and remove the spongy white part with seeds. After that, cut into 2-inch long chunks. 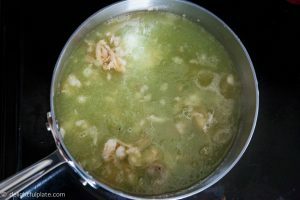 Bring the stock to a boil in a pot and add opo squash chunks. Cook for 3-5 minutes until the stock is boiling again and opo squash is softened. 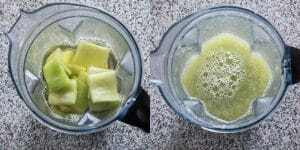 Transfer opo squash chunks and the stock to a blender and puree until smooth. You can also use an immersion blender to do this. Place a pot over medium - medium high heat, add oil and sauté shallots until fragrant. Add shrimp pieces, stir and cook for 30 seconds. 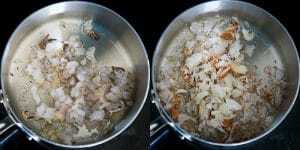 Then add crab meat, 1 teaspoon of fish sauce and black pepper, stir and cook for about a minute. Pour the opo squash puree into the pot. Stir and when it starts to boil, lower heat to a simmer. Add the remaining fish sauce (more or less to taste). Whisk the cornstarch/tapioca starch with 1 1/2 tablespoons of water and drizzle the mixture slowly into the pot. Gently stir while adding the mixture until the soup is thickened to your liking. Cook for 1-2 more minutes. Add black pepper and sliced scallions, stir and then transfer to serving bowls. You can add more scallions and cilantro to each bowl. Placing a 3''x4'' piece of kombu in a pot with 2 1/2 cups of cold water over medium heat. When the water comes to a near boil, remove kombu. Vegetable stock, chicken stock or pork broth will also work.